New technologies are transforming the way we live and work. Remote virtual teams are keeping tens of thousands of workers out of office buildings and e-commerce makes it unnecessary to drive to stores for our goods. The combination of all of these factors and more is shaping the future. Hence it's imperative that we broaden our definition of and change our approach to business sustainability for the 21st Century through effective and efficient management of People, Planet and Profits. Today's narrow focus on risk management, reporting and operational efficiency must shift and give way to 21st Century practices which view sustainability as a central driver of innovation. 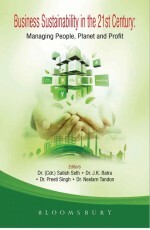 The book is a compendium of research contribution of academicians and industrial expertise and will add value to the diverse aspects of business and its long term sustainability.